An opposition party in Malawi says lawmaker Atupele Muluzi, the son of former president Bakili Muluzi, has been arrested in connection with the torching of a police station. United Democratic Party (UDF) officials say Muluzi, who has been described as an aspiring 2014 presidential candidate, was detained at a police roadblock as he traveled from the administrative capital Lilongwe to the commercial capital Blantyre, and was taken away for questioning. National police spokesperson David Chingwalu had earlier said he was not aware of Muluzi's arrest. But UDF secretary general Kennedy Makwangwala told VOA he confirmed the arrest. "I have just got a phone call that Atupele Muluzi has been detained at Bunda turn-off road block by police," said Makwangwala. "I don't know why they have detained him, maybe it's because of this issue we are talking about, that they have warrants of arrest for some members of the party. I can't say what are going to do on radio or newspaper. We will only do what we want to do." Muluzi's supporters had burned down a Lilongwe police station and destroyed cars parked near the station after they clashed with police at an anti-government rally on Sunday. 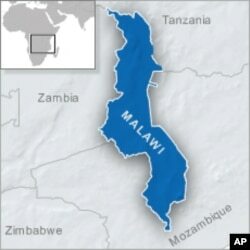 International donors have cut aid to Malawi, citing concerns President Bingu wa Mutharika has become autocratic. At least 19 people were killed by police during anti-government demonstrations and looting in Malawi last year.